Over a year ago I reviewed the Mirage I/II, at that time it was a staple in my shoe rotation, and had become my favorite "everyday" trainer. What I have always liked about the shoe is that it provides a little more cushioning and guidance than the Kinvara, but it was still light and responsive. 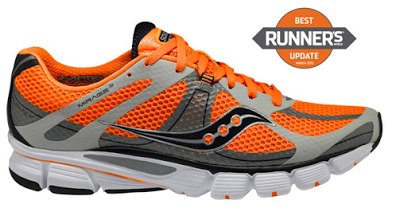 Earlier this spring I finally broke into a box of Mirage 3s, which was given the "best update" by Runner's World. Sometimes a major update to a shoe you already like can be a problem - but in this case, the Mirage went from a shoe I really liked to a shoe that I'm kind of in love with. I've put about 350 miles in my first pair (which are still going strong - I'll easily get double that mileage out of them), but I could feel the differences one my first couple runs. The new version is lighter and more flexible, but retains the touch of guidance and cushion that makes this shoe so important. One look at the side profile and bottom of the shoe and you can see where the Saucony performance engineers made some modifications. 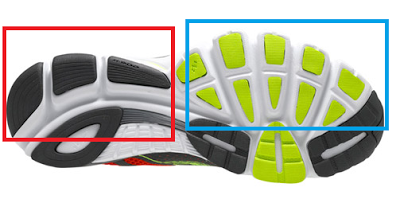 The heel is decoupled (red boxes below) and they added some additional flex grooves in the forefoot (blue boxes below). This creates a much more flexible and responsive shoe. Trust me, try it on and you'll love the feel. The shoe's upper has a great fit, using seamless Flexfilm, and feels similar to the Kinvara. This also cuts down on weight. At 8.7 ounces (M9), its nice and light. In additional to recovery runs, I really like using the Mirage 3 for long runs and fast-finish "medium" runs, where I run some tempo in the final miles. I like that it is supportive enough for a long run without beating up my feet/legs, but I have no problem dropping some fast miles feeling smooth. I'll even occasionally run some 200m reps on the track in these at the end of a recovery run. 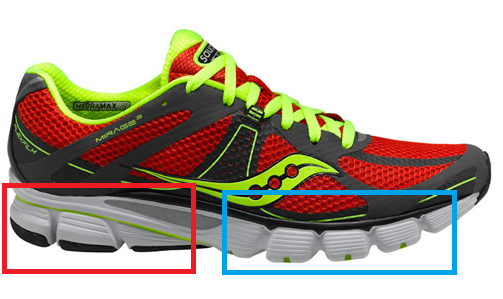 I think the Mirage 3 is one of the most versatile shoes in Saucony's lineup. I use them for a wider variety of types of runs than anything else in my repertoire*. *Currently, I'm using the same rotation I have in the past: Kinvara and Ride for recovery runs, Mirage for recovery / long runs / some workouts, Fastwitch for tempo runs / long repeats, and Type A for shorter intervals.